Monkey pose, or hanumanasana in Sanskrit, is the yogic version of the splits. 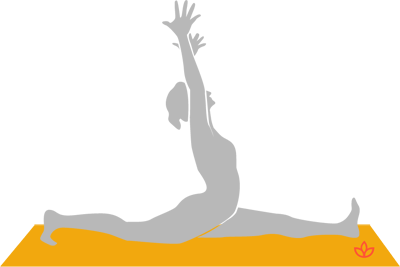 In this advance seated posture, the legs are stretched forward and back, and the arms are lifted toward the sky. The pose both requires and develops flexibility in the legs and hips. Begin kneeling with the fingertips resting on the floor beside the knees. Exhale and stretch the left leg forward. At the same time stretch the right leg back. Keep the weight in the hands. Once the front hamstring and back thigh touch the floor, inhale and lift the arms to the sky. Inhale and carefully return to kneeling. Change sides.